But maybe that's not so true anymore. While he's had his hand clenched into a fist for the past 50 years, it looks as if Punchy is finally getting some anger-management therapy. 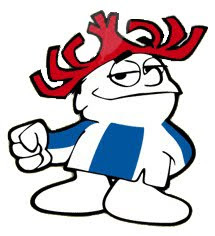 Hawaiian Punch is giving the angriest mascot in the world a makeover -- they even have their website under construction to rework the little dude. Waffle Whiffer Zone found a box of fruit snacks that gives a sneak preview of his new look: Gone is the clenched fist; he's now doing a hang-loose sign instead. Wondering if the much-assaulted, Mr. Howell-looking tourist Oaf is going to come back and exact some revenge on the kinder, gentler Punchy? Us, too.